All that remains of a Michigan woman’s Nissan Maxima is a burnt out hulk after she says one of her cellphones burst into flames while she was driving. Her car is totaled, but the woman says she was just lucky to escape with her life. The woman, who asked to remain anonymous, spoke to Detroit ABC affiliate WXYZ Friday after her car caught fire and burned. She now says she is considering a lawsuit. 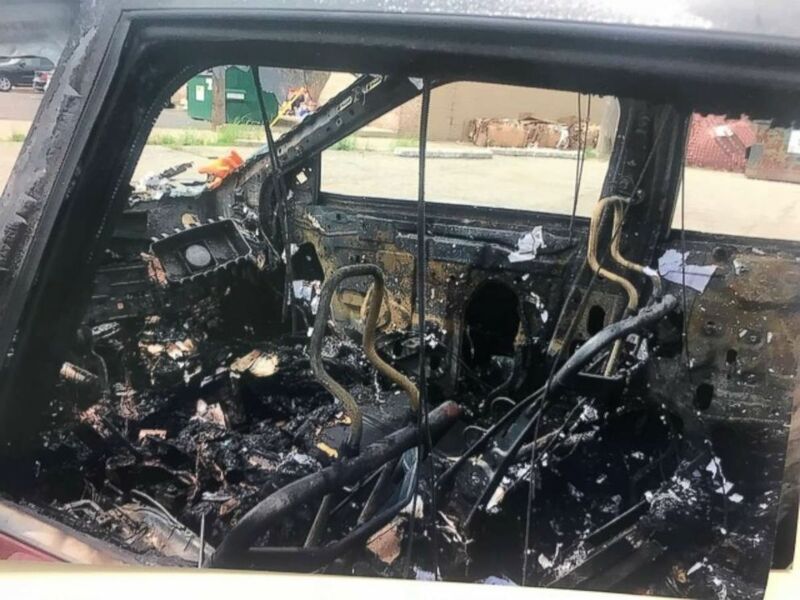 She was driving on Evergreen Avenue in downtown Detroit on May 21 and said she had a Samsung Galaxy S4 and Galaxy S8 in her cupholder when she saw a spark and one of the phones caught fire. “I thought I was going to die when I saw the sparks and the fire,” she told WXYZ. “It happened quickly. It just went up in flames. People were telling me to get away from the car. What if I was on the highway stuck in traffic and couldn’t get out?” she added. A woman in Detroit says her cellphone burst into flames while she was driving and she had to pull over and escape the fire. The woman pulled over to the side of the road and got out of her car. It was quickly engulfed in flames. The Detroit Fire Department confirmed to WXYZ they responded to the fire. Samsung has had problems with phones bursting into flames, but neither the Galaxy S4 or S8 are on recall lists. The phone maker says it is investigating the incident. Samsung dealt with major fallout from one of its phones overheating in late 2016. The Galaxy Note7 had problems overheating and bursting into flames shortly after it was released in August 2016. It officially issued a recall the following month, and then halted production in October 2016. The Federal Aviation Administration banned the Note7 from flights in October 2016, as well. A lawyer for the woman whose car burst into flames says they reached out to Samsung and may file a lawsuit, though none has been filed yet. The woman’s lawyer, Gerald Thurswell, said he expects a recall once an investigation is complete.